first time in snow pants! This upcoming week is the last week before winter break, so I have to cram a lot of stuff into it, because I pretty much get nothing done when the kids are home, since they always want to do fun things and my willpower is pretty weak and I mostly only want to do fun things, too. They are my enablers! So this week is my go-to week, to finish the Xmas shopping, bake some cookies, make sure we have ingredients for Xmas dinner and random cocktail nights, and chacuterie for when I don’t want to cook, and enough Ginger Ale and gingerbread to choke a reindeer. Plus all the external stuff: meetings at the kids’ school, plus a room mom event where I get to lead a class in a craft, only I can’t figure out from the emails which kid’s class it is that I am supposed to be all help-y in. I also need to get a top-to-bottom housecleaning in, get some charity stuff off my docket, and send out the last few Xmas cards. Does it sound like I am complaining? I am not. Because this is the first year that I can just do all of this stuff, without wedging it in between 60 hours of work a week. The first year I can make gingerbread in the middle of the afternoon, or watch a trashy movie while I fold laundry and clean my room, without guilt. This leaning out stuff is great. Of course, I haven’t written a word, but that is for January. I will start that in January, that writing thing, right? Right now, I am enjoying the tail end of a relaxing weekend. I have a little girl tucked up in my bed, watching TV, and once every hour or so she wanders out to find me to tell me how sick she is, and I get her juice and make a fuss and tuck her back in, and she is happy. Her sister got to go to the grocery store with Daddy, just the two of them, for ginger ale and popsicles, and is quite chuffed with herself. I cleaned out the fridge (like a superhero) and made a meatloaf for dinner. Yesterday, a friend stopped by, and instead of plowing through all the volunteer work we were supposed to be meeting about, we ended up sitting around drinking coffee, eating banana bread, and chatting, while my husband and kids shoveled snow. 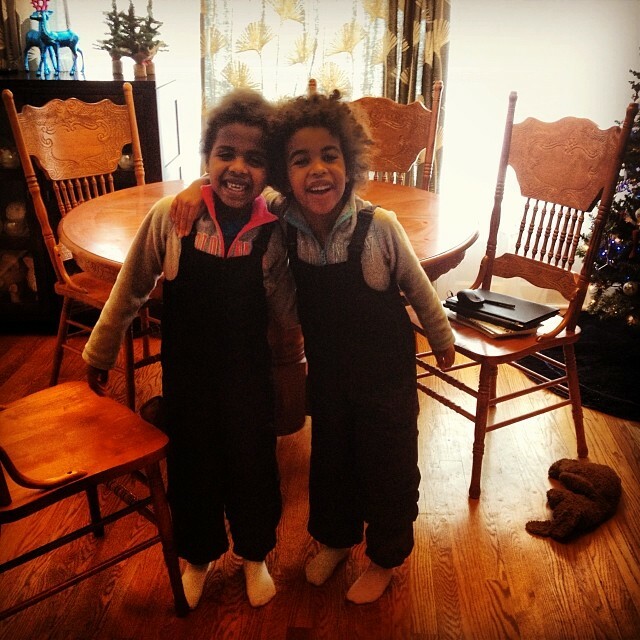 We got so much snow yesterday, and finally had a reason to bust out the kids’ snowpants. It was the first time they have ever worn snowpants, and they were mightily impressed, although in true ‘my life is all cliché’ fashion, everyone had to pee the second we wrestled them into their snow gear. Its been the perfect weekend, and the model for our winter break: reading, naps, playing outside, meeting up with friends, and eating. Simple life, happy wife.